In 10-inch skillet, cook beef over medium-high heat 5 to 8 minutes, stirring frequently, until beef is thoroughly cooked; drain. In 4- to 5-quart slow cooker, stir beef, water, taco seasoning, tomatoes, onion and garlic until well blended. Cook pasta as directed on box;drain. Uncover slow cooker; stir in cream cheese until melted. Stir in pasta and shredded Cheddar cheese until well blended. Cook uncovered on High heat 5 minutes longer or until cheese is melted. Serve with chopped cilantro. 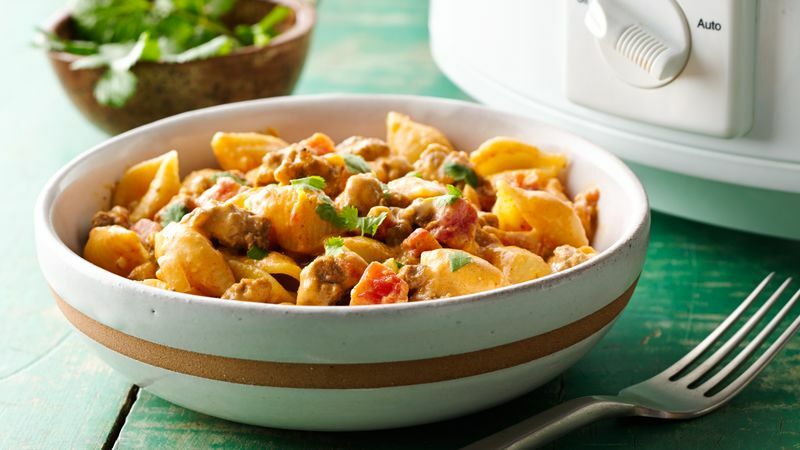 If you want to add some spice to your Slow Cooker Taco Pasta, try topping the finished dish with your favorite spicy salsa. If you happen to have any leftovers, pack it up right away for an easy lunch to take to work the next day!